When I say “Carnival“, most people think “Oh! That’s the huge party in Rio de Janeiro”. 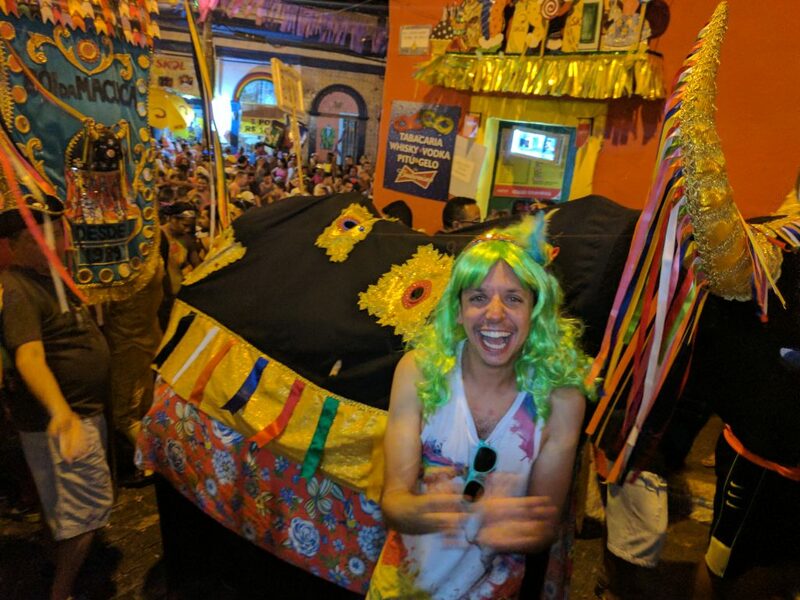 True, Rio does have one of the largest Carnivals in the world. However, during this time of year, parties are happening all over the place. During the Carnival celebrations, each Brazilian region has their own flavour and style of festivities. Most notably is the different style of music played during competitions and blocos (street parties). 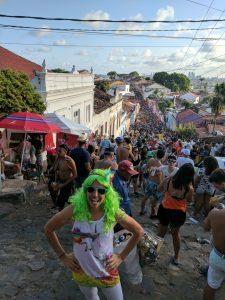 My travels took me to Recife in Pernambuco, which hosts the largest carnival parade in the world with over 2 million participants. 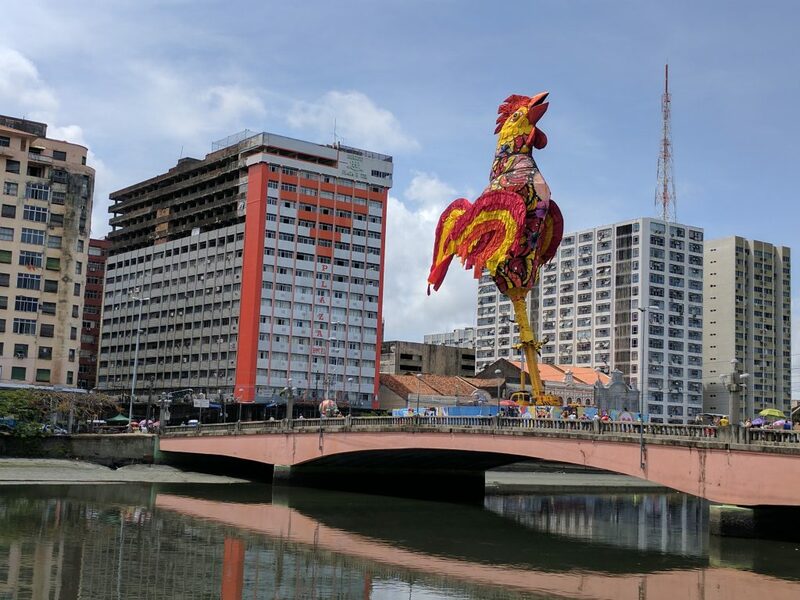 The parade is called Galo da Madrugada due to the large rooster that they haul around town early in the morning. That first night in Recife I decided to head out and see what all this carnival hub-bub was about. It did not disappoint. Getting swept up in throngs of people while a brass band plays all the local favourites was something I hadn’t really experienced before. You are essentially apart of a parade that just moves around town, drinking, dancing, and having a great time. Digging through my bag I remember the crazy unicorn tank top and pants that I wore for Dreamstate. Guess this will have to do! After taking three times as long to get to her place due to throngs of people and a typical Brazilian thunderstorm, I am greeted by her, her two friends, and two empty bottles of wine on the table. We get to know each other as we pre-drink before heading out to the party happening below. By this point I can tell already that we’re going to have an amazing time. With the sun still shining (read: we’re in the process of going too hard too soon) we hit the street to dance and drink up a storm. 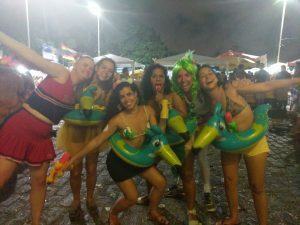 We surf the waves of people through Olinda, beers in hand, only to stop and high-five anyone we see in amazing costumes. I always loved coordinated outfits! Side Note: One great thing about my outfit? No pockets for people to pick-pocket! Downside? I had to shove all of my Reals in my underwear. Let’s just say all the dancing didn’t bode well for any vendor I’d hand my soggy notes to. We continue to drink, dance, and make out in the middle of the street. Things are hazy by this point, but I do remember someone tossing water (I hope it wasn’t beer) out of a second story window to “cool off” one of our make-out sessions. It’s at this point we figure we might as well head back home and finish what we started. Brasilia is a city out of the way for me, being in the interior of the country. No tourist goes there as it’s a planned capital similar to Canberra in Australia. Mainly boring government buildings and institutions. Wait. What kind of job does she have if she lives and works in Brasilia? She replied: “Oh, Uhmm. I work for an embassy, I’m a diplomat!”.